The unpiloted capsule soared into a late afternoon sky from launch pad 39A at NASA’s Kennedy Space Center at 5:07:38 p.m. EDT (2107:38 GMT) Saturday, two days later than planned after a thunderstorm prevented liftoff Thursday. Nine Merlin 1D engines, generating a combined 1.7 million pounds of thrust, powered the 213-foot-tall (65-meter) Falcon 9 rocket through a high-altitude cloud deck as the launcher arced to the northeast, aligning with the space station’s orbital track. It was the 100th launch from historic pad 39A, the previous home to Saturn 5 moon rockets and space shuttles. SpaceX began launch operations there in February, and has now flown six rockets from the seaside launch complex. 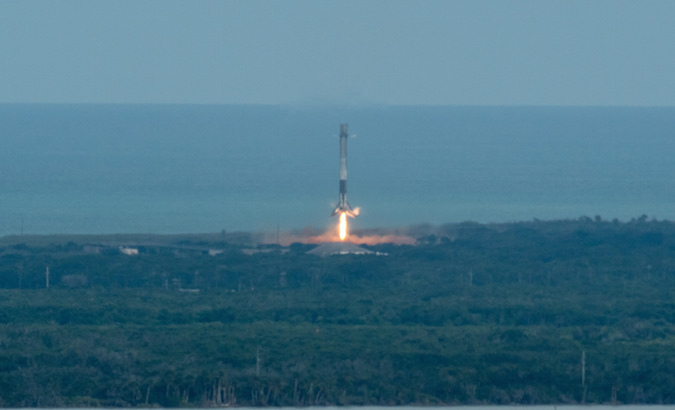 The Falcon 9’s first stage engines shut down and deployed the rocket’s second stage more than 40 miles (65 kilometers) over the Atlantic Ocean, then the booster activated nitrogen cold gas thrusters to flip around and fly tail first. While the upper stage accelerated into orbit, three of the Merlin’s first stage engines ignited to begin maneuvers to return the first stage to Landing Zone 1, and two more braking burns slowed the 156-foot-tall (47-meter) for a smooth vertical touchdown around 9 miles (14 kilometers) from where the mission started. The landing marked the fifth time SpaceX has returned a rocket booster to Cape Canaveral — all successful. The commercial launch company has recovered 11 rockets in 16 tries overall, a figure that includes landings at sea. SpaceX aims to reuse the first stages, an initiative the company says will slash launch costs. 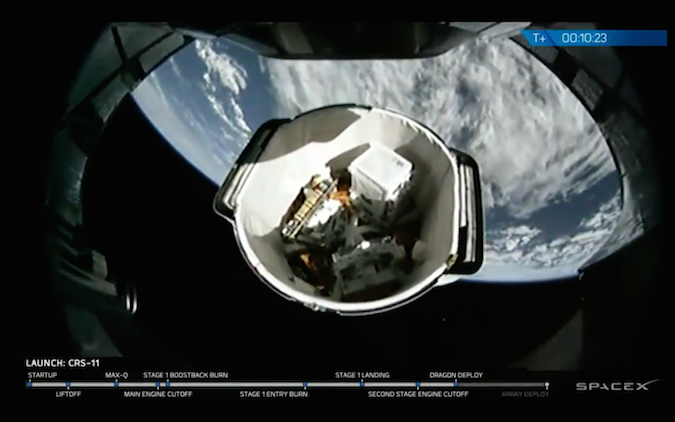 The rocket that launched on the space station resupply run Saturday was entirely new, but the primary structure of the gumdrop-shaped Dragon cargo capsule on top previously flew on a 34-day orbital mission in September and October 2014, another first for SpaceX. Engineers examined and stripped the spacecraft’s structure after it splashed down in the Pacific Ocean on Oct. 25, 2014, following a visit to the space station, but the “majority” of the Dragon cargo capsule is the original article, according to Hans Koenigsmann, SpaceX’s director of flight reliability. He said engineers compared the structural loads and shaking components inside the Dragon capsule experienced on its 2014 flight with their design limits. SpaceX goes through a similar review of parts on Falcon 9 boosters before clearing them for a re-flight, he said. 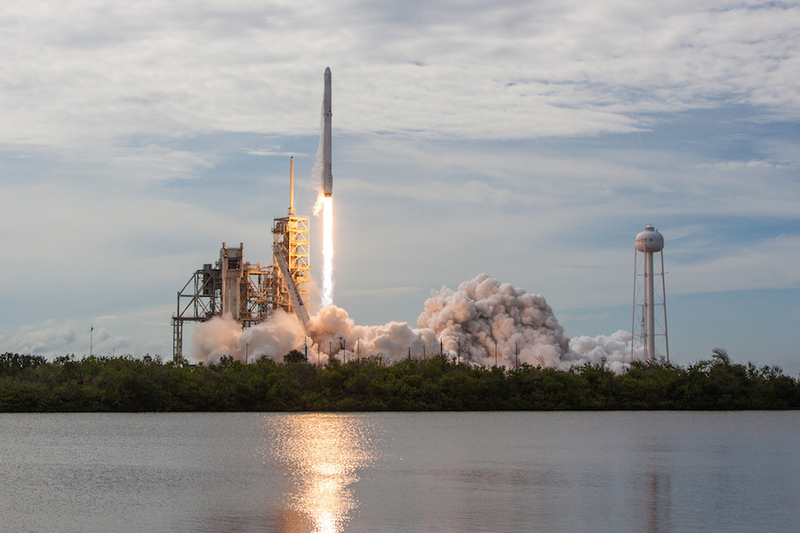 Kirk Shireman, NASA’s program manager for the International Space Station, said before Saturday’s launch that the space agency expects to approve SpaceX plans to re-fly more Dragon capsules and Falcon 9 boosters on future cargo missions to the orbiting research outpost. SpaceX has two multibillion-dollar contracts with NASA to ferry equipment to and from the space station. The terms of the deal call for at least 26 missions, and 10 of those are in the books, including a failed cargo launch in 2015. 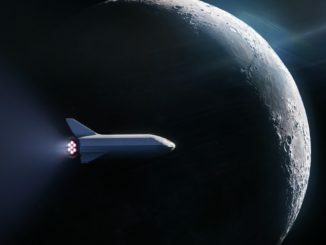 NASA has also contracted with SpaceX to develop a Crew Dragon vehicle capable to ferrying astronauts to and from the space station beginning as soon as next year. 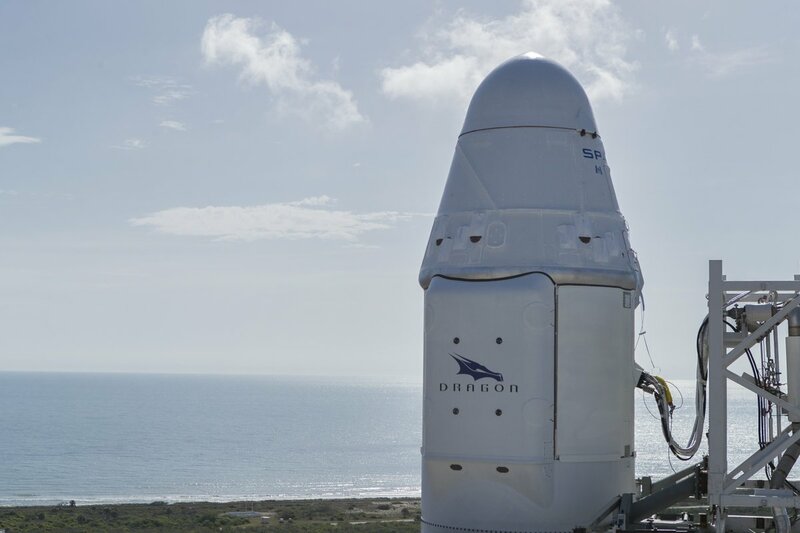 Officials said SpaceX’s next cargo mission to the station, scheduled for launch some time in August, will employ a newly-manufactured Dragon capsule. According to Koenigsmann, SpaceX technicians replaced several items that were exposed to salt water after splashdown, such as batteries and the capsule’s heat shield. But the hull, thrusters, harnessing, propellant tanks, and some avionics boxes are original, he said. “I can tell you the majority of this Dragon has been in space before,” Koenigsmann said. Officials did not say if NASA was compensated for its approval of SpaceX’s plans to launch a refurbished Dragon capsule to approach the space station. Without specifying details, Shireman said the agreement is part of a normal back-and-forth between the government and the commercial operator, in which one party barters with the other. The Dragon spacecraft is on a two-day voyage to the space station, where it is scheduled to arrive at 10 a.m. EDT (1400 GMT) Monday, when astronauts Peggy Whitson and Jack Fischer will grapple the approaching capsule with the station’s Canadian-built robotic arm. “The space station is in excellent shape, ready to receive Dragon,” said Ven Feng, manager of the space station transportation integration office at NASA’s Johnson Space Center in Houston. The robot arm will move the Dragon supply ship to a berthing port on the station’s Harmony module, where it is scheduled to stay for nearly one month. The station crew, reduced to three after the landing of a Russian cosmonaut and French astronaut Friday, will unpack 3,761 pounds (1,665 kilograms) of equipment and experiments loaded inside the Dragon capsule’s previously-flown pressurized module. Some food and provisions for the station’s crew are strapped inside the Dragon freighter, but research investigations take up the bulk of the ship’s volume. Three payloads stowed inside the Dragon’s external rear trunk will be be removed robotically. One of the unpressurized experiments, NASA’s Neutron Star Interior Composition Explorer, will study the super-dense leftovers from violent supernova explosions. Made of 56 individual X-ray telescopes, the NICER instrument will observe neutron stars, the collapsed city-sized remnants of stars that have used up all of their nuclear fuel. Scientists compare the density of a neutron star to cramming the mass Mount Everest into a sugar cube. One teaspoon of neutron star matter would weight a billion tons on Earth, according to NASA. Developed by NASA’s Goddard Space Flight Center, the Massachusetts Institute of Technology and the Naval Research Laboratory, the neutron star observer will spend 18 months detecting X-ray signals coming from deep space. Another payload bolted inside the Dragon spacecraft’s trunk is a mounting platform for multiple Earth-imaging instruments, such as high-resolution digital cameras and hyperspectral imagers. Developed commercially by Teledyne Brown, the MUSES device to be attached outside the space station is designed to accommodate several Earth-observing cameras by providing the individual instruments with pointing, power and data relay connections. The third unpressurized experiment on Saturday’s launch is the Roll-Out Solar Array, or ROSA, made by Deployable Space Systems of Santa Barbara, California. The U.S. Air Force Research Laboratory funded the solar array test flight, which is intended to test the structure’s ability to extend and retract, check its resilience to vibrations and other forces, measure its thermal gradients, and verify it can generate electricity. 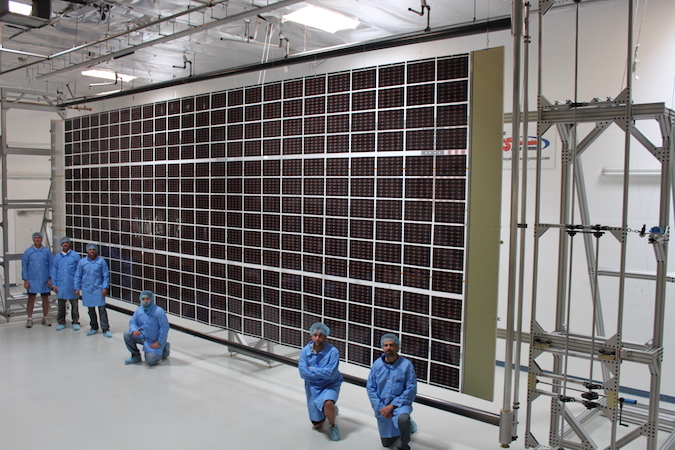 The new solar array design, which unfolds like a party favor, could be used on future commercial satellites. The array launched rolled up in a spool, but the experiment will be pulled from Dragon’s trunk around nine days after launch by the station robotic arm. While remaining in the arm’s grasp, the solar array will extend to a length of about 15 feet (5 meters) and remain unfurled for around a week. ROSA is important to the space industry,” said Jeremy Banik, the ROSA demonstration’s principal investigator from the Air Force Research Laboratory. “All spacecraft need power, and tradiational solar panels are made with square, flat plates that accordian fold with mechanical hinges. “The problem is, these panels tend to be heavy and bulky, and we just can’t make them any bigger than what we do today. ROSA solves this problem by shrinking mass by 20 percent and stowed volume by a factor of four over these rigid panels,” Banik said. Once the week-long test is finished, the experiment will be returned to the Dragon’s trunk for disposal. 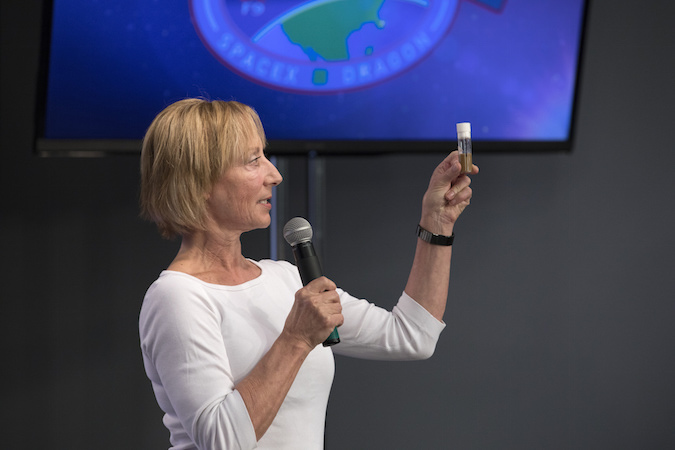 Live animals were also aboard Saturday’s launch, including 40 mice inside specially-designed transporters for an investigation into a treatment that could combat bone loss in astronauts on long-duration space missions and osteoporosis in patients on the ground. Twenty of the mice will return to Earth alive with the SpaceX Dragon supply ship in early July, the first time the commercial spacecraft has landed with live animals on-board. The 20 mice that come back alive will go to UCLA’s laboratories for additional research and treatment. “If successful, this will have tremendous implications for patients on Earth because if you look at statistics … approximately one in every two to three females over the age of 50, or one in every four to five males over the age of 50, will have an osteoporosis-related fracture,” Soo said. “We are hoping this study will give us some insights on how NELL-1 can work under these extreme conditions and if it can work for treating microgravity-related bone loss, which is a very accelerated, severe form of bone loss, then perhaps it can (be used) for patients one day on Earth who have bone loss due to trauma or due to aging or disease,” Soo said. A swarm of fruit flies launched to the space station to examine how prolonged spaceflight affects their heart function. “We would like to understand the role of microgravity on astronaut heart function in order to try to prevent long-term effects when they are in space for long periods and after they come back,” said Karen Ocorr, a co-investigator on the fruit fly experiment from the Sanford Burnham Research Institute. Saturday’s successful launch clears the way for four more SpaceX missions over the next month. Next on the company’s jam-packed manifest is BulgariaSat 1, Bulgaria’s first communications satellite, scheduled for liftoff from the Kennedy Space Center on June 15. BulgariaSat 1’s launch window June 15 opens at 2:10 p.m. EDT (1810 GMT) and extends two hours. Koenigsmann told reporters he did not expect BulgariaSat 1’s mid-June launch to be delayed after the two-day slip in the cargo mission’s blastoff this weekend. 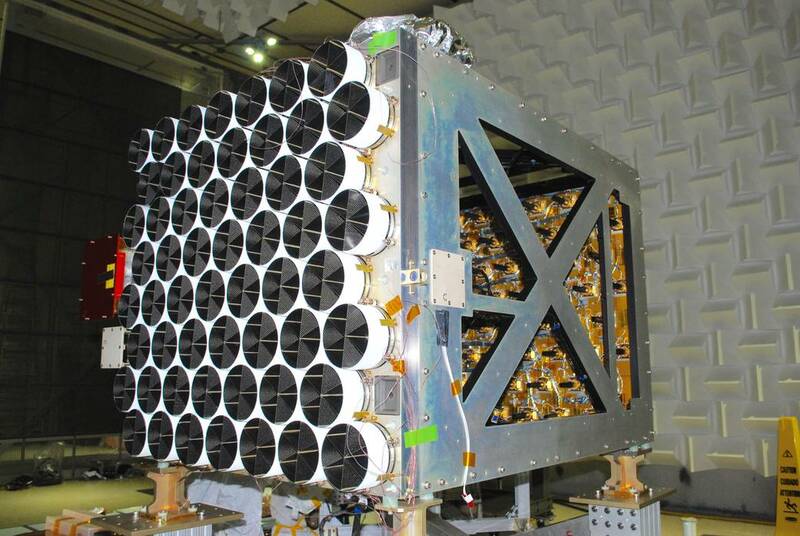 BulgariaSat 1, which is already being prepared for launch in a processing facility at Cape Canaveral, will launch on a previously-flown Falcon 9 booster. SpaceX plans its fourth launch from Vandenberg Air Force Base in California on June 25 with the second batch of 10 small new-generation satellites for Iridium’s orbiting voice and data relay network. The Intelsat 35e high-throughput communications satellite will follow no earlier than July 1 from SpaceX’s Florida launch base. The SpaceX launch teams have conducted three launches in the last 34 days, with three more planned in the next four weeks. Ground crews, engineers and managers are “learning to deal with this operation better and better every time,” Koenigsmann said after Saturday’s launch. “The situation that we launch from both coasts is something that is somewhat new for us. 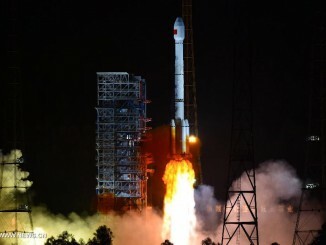 “We’ve had this with a little bit of separation in the past, and we’ve set up the teams to be able to cope with that, and have the ability to launch from both sites within a short period of time,” he said.